Framesizes: 20, 21.5, 23 and 24.5"
The Clubman is the epitome of the club cycling tradition firmly rooted in British sporting culture. In the heyday of this noble pastime, one bicycle would be used for many purposes, anything from short distance city rides to the thrill of time trials and the challenges of touring across the country or even the world. Here at Pashley we have strived to distill the very best of this tradition into a reliable and beautiful modern bicycle. Indeed, the use of legendary Reynolds 531 steel with investment cast lugs was the choice of the men of this era, offering a perfect balance between weight and performance through an elegantly refined aesthetic. 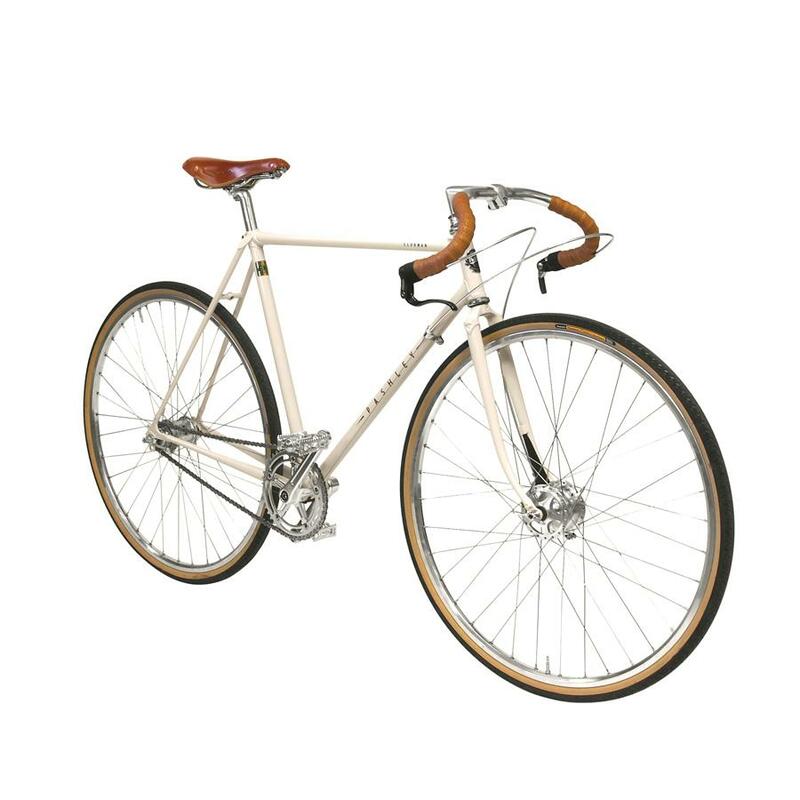 The Clubman Urban is the simplified version of the Clubman designed specifically for reliable and agile city cycling. The Major Taylor drop handlebars give an aggressive yet comfortable riding position, and luxuries like the narrow Brooks Swift leather saddle and iconic GB wingnuts create an understated sense of beauty and pace. Major Taylor handlebar: Shallow drop racing bars for active, aerodynamic riding. Finished with traditional leather bar tape. 3-speed fixed or 2-speed kick-shift gear option: The 3-speed option (shown) offers a unique combination of fixed gear with three different ratios (no freewheel). Clubmen used to ride fixed during the winter to perfect their smooth pedalling action. Controlled via a handlebar-end gear lever. The 2-speed option offers easy-action gear change and braking - a gentle ‘kick-back’ action of the pedals changes between gears; a little more force applies the rear brake. Iconic GB wingnuts: Adds to the Clubman's authenticity and makes removal of the wheels that little bit easier. Manufactured in England using the original tooling. Double-wall aluminium rims with double-butted stainless spokes: Stiffer than standard single-walls, double-wall rims provide added strength without increased weight. Rims also feature a heavy-duty box-section rim profile and double-butted stainless-steel spokes which help relieve impact stress from the rim and build a lighter, more resilient wheel. Skinwall tyres with extra puncture protection: A touring and urban tyre with excellent ‘all-round’ tread patterns, and an inner Kevlar guard for extra puncture protection. Skin sidewalls are more flexible than standard carbon black, which helps to reduce rolling resistance and offer a more supple ride. Traditional Brooks 'Swift' leather saddle: The handsome 'Swift' is a gentleman's racing saddle with delicately hand-skived lower sides for greater comfort whilst pedalling. The leather allows the saddle to breathe and form to your shape over time becoming uniquely comfortable. Finished with large hand-beaten copper rivets, and handy loops on the rear for luggage attachment. Traditionally hand-built Reynolds 531 lightweight steel frame with investment-cast, fine cut-away lugs: With classic geometry for dynamic riding. Built using 100 year old traditional methods, with original lightweight Reynolds butted 531 tubing hand-brazed into fine cut-away lugs. Finished with pointed wrap around top eyes featuring the Pashley name in relief, and matching lugged and brazed raked fork. Cast drop-outs with mudguard eyes. Iconic GB crankset: light alloy chainset with classic sqaure fluted crank. There are two Sturmey Archer gearing options: the S3X 3 speed fixed hub, giving the control of a fixed gear with the flexibility of three gear ratios, or the S2C 2 speed coaster hub, affording you the ability to brake or change gear with no more than a quick back pedal. All this comes together to produce a bicycle with real versatility and simplicity, perfect for speedy rides across town. Brakes Sturmey Archer XFD front hub brake with reverse action bar end lever on both gear options. Coaster brake on S2C version. No rear brake on S3X version. Tyres 700x32c Panaracer Pasela Gumwall tyres with Kevala guard for extra puncture protection.